On Sunday, August 20th, at St James Catholic Church in St Joseph, Missouri, six women were invested with the holy habit of St Benedict, and two sisters made their simple professions at the hands of the Most Reverend James V. Johnston, Jr., Bishop of Kansas City-St. Joseph. The sisters belong to the flourishing community of the Benedictines of Mary, Queen of Apostles. The Solemn High Mass in the presence of a prelate at the throne was celebrated by Rev. Mark Bachman, O.S.B., of Clear Creek Monastery, assisted by Fr Peter Bauknecht, FSSP and Fr Lawrence Carney, with recently-ordained Fr Alex Stewart, FSSP, as the Master of Ceremonies, and many clergy, monks, nuns, and lay people in attendance. 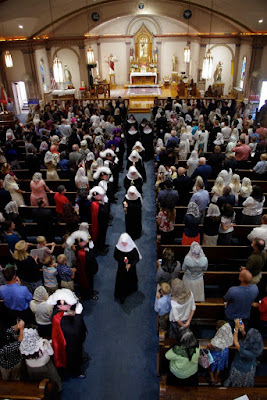 Never having been to a traditional Roman investiture and profession of nuns before, I found it to be one of the most sublime liturgies I have ever had the privilege of attending. His Excellency Bishop Johnston graciously shared with me his splendid homily, and the photographer sent me exquisite photos, which have been interspersed into the homily. Our readers are encouraged to spread these images far and wide, so that everyone, especially young Catholic women discerning their vocations, may see visible signs of the beauty of a life of consecrated self-sacrifice to which the Lord Jesus Christ, Bridegroom of the Church, is inviting many souls — today, as always. Without this life fully embraced and radically lived, the Church only limps along, half-dead. With it, she can run in the way of God’s commandments. Homily of Bishop James V. Johnston, Jr.
Reverend Fathers, Mother Cecilia, dear Benedictine Sisters of Mary, Queen of Apostles, other Women and Men Religious, Family members, Friends in Christ one and all; it is good to be with you for this Mass of First Profession and Initiation into the Novitiate of the Benedictine Sisters of Mary, Queen of Apostles. The Church joins the Sisters today in thanksgiving for the gift of vocation and consecrated religious life, as this Community of the Priory of Our Lady of Ephesus celebrates the Religious Profession and the Investiture of so many sisters! The sisters before the ceremony. Our gratitude is first to God who gives the growth, and then gratitude to the families of the sisters who provided the “good soil” for the seeds of faith to grow. If you think about this list, all of us are supposed to do these things, not just the Sisters in the monastery; this is the way we are all called to live because of our Baptism into Christ. 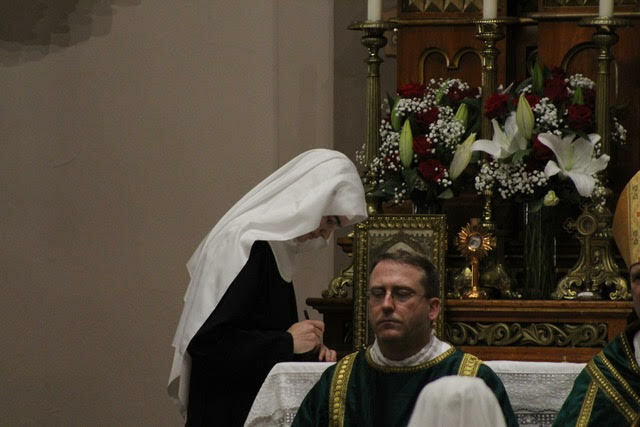 The difference is that the religious sister gives herself entirely over to this within a community, while the other members of the Church must also attend to other obligations that flow from their vocations. 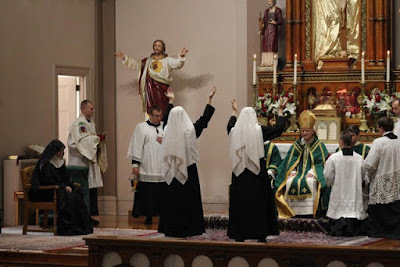 And so, this is one of the great blessings of consecrated religious life in the Church: consecrated religious stand before us as living reminders of what we are all called to pursue in our own particular way. The bishop summons the two sisters who are making profession. Several years ago, in one of his homilies, Pope Benedict XVI recalled a short story of the Russian writer Leo Tolstoy. In the story, a severe king asks his priests and wise men to show him God. They are unable to do so. A shepherd coming in from the fields steps forward to take on the task. He tells the king that his eyes are not good enough to see God, but the king persists in wanting to know at least what God does. “Then we must exchange our clothes,” says the shepherd. The king, reluctant but curious, consents. He gives his royal robes to the shepherd and has himself dressed in the poor man’s simple garments. “This is what God does,” says the shepherd. Indeed, as St. Paul tells us in his Epistle to the Philippians, Christ, the Son of God, did not cling to his equality with God but emptied himself, taking the form of a servant, being born in human likeness; and being found in human form he humbled himself, even to death on a cross (cf. Phil 2:5-8). This sacred exchange between God and ourselves has been pondered by the saints and Fathers of the Church ever since. God took on what was ours, so that we might receive what was God’s and become like God. In this exchange, Mary served as the gateway, as she would throughout her life. The professed sister’s white novice veil is replaced by the black one. The Sacrifice of the Mass continues with the Offertory. 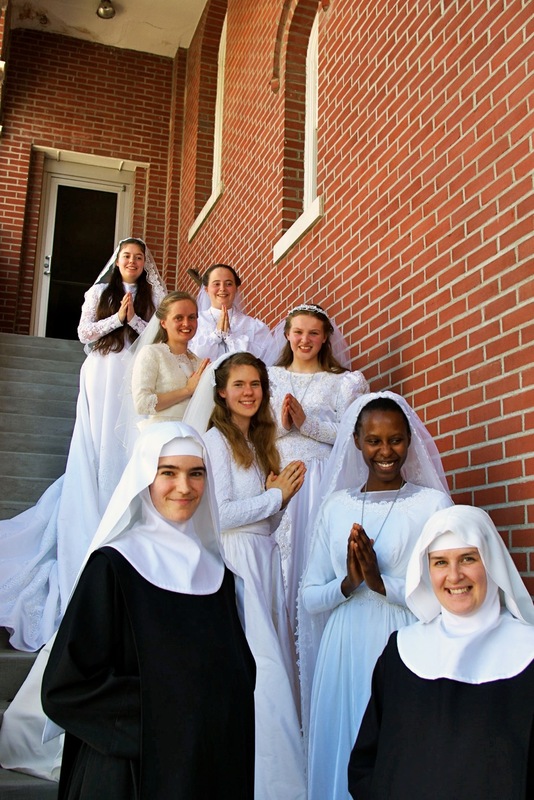 Today, these young women who will make profession and be invested in the holy habit will take a step of faith and love in their response to the Holy Spirit’s action in their lives. Like Mary, they have been called to give themselves to God’s design. And, like Christ, her Son, they are imitating Him by making a holy exchange, giving up what is theirs to take on what belongs to Him—to make a sacrifice of love. This will be evident in the rite, at times very powerfully, as when those who are invested make an outward sign of their sacrifice by giving up their natural “crown” — their hair, and then receiving the habit. Dear Sisters, by entering religious life, you are embarking on a way of life that emulates the Blessed Mother and her Son along the way marked out by St. Benedict and the charisms of your monastic community. All of this is a response to grace at work in your lives, much along the lines that grace was at work in the life of the deaf and mute man in the Gospel account today. After Holy Communion, the novices come forward for the ceremony of clothing. Reflecting on this reading, we might say that it is about a “grand opening.” It’s likely that all of us have attended some kind of “grand opening” at one time or another. A new store . . . a school . . . a bridge. We cut ribbons, we read proclamations, we have dedications and blessings. I have done this several times in the past few weeks in opening two new Catholic Schools in our diocese. And, perhaps in the near future we will have a kind of grand opening with the consecration of a new church in Gower! Right, Mother? In this Gospel reading for today’s Mass we have an event that describes a healing that is only recorded in St. Mark’s Gospel. Having healed and fed their fellow Jews, Jesus and his disciples spent time in Gentile territory. During a previous visit there (Mk 5:1-20), Jesus had freed a man from demonic possession and did so in a memorable way when he sent the unclean spirits into a heard of pigs that went rushing into the sea. Although the people had begged Jesus to leave on that visit, they bring him a deaf and mute man when he returns. The healing is very vivid. And, the one word that grabs our attention is the Semitic word, Ephpheta. This is the one-word prayer that Jesus uses and it means, “be opened!” Certainly, for this deaf and mute man, his encounter with Christ was a “grand opening.” His healing was a fulfillment of the prophecy of Isaiah: “Hear is your God, he comes with vindication; With divine recompense he comes to save you. Then will the eyes of the blind be opened, the ears of the deaf be cleared; Then will the lame leap like a stag, then the tongue of the dumb will sing” (Is 35:4-7). In some ways, this prayer of Jesus encapsulates the entire Christian life. Sin closed our life off from God, and Christ has opened the way for God’s grace to return to our souls. Of all our Lord’s grand openings, perhaps the greatest is the Resurrection. At the Resurrection, not only was Christ’s tomb opened to His glorified and risen body, but also heaven was opened for mankind again. And, our graves were opened. In essence, this is what St. Paul proclaimed as the central core of the Christian message in the Second Reading today from his first epistle to the Corinthians: “I delivered unto you first of all, which I also received, how Christ died for our sins according to the Scriptures; and that He was buried, and that He rose again the third day according to the Scriptures . . .”. Another detail in the Gospel worth noting is that before Jesus brought about the healing of the deaf and mute man, he took him off by himself, away from the multitudes. This is an action seen not only here. Jesus takes his disciples away from the multitudes to pray with them and to teach them, even to rest with them. When he healed the little daughter of the synagogue official, he put the noisy crowd out, and took only his disciples and the girl’s parents. Sisters, in your life in the monastery, through prayer and work under the guidance of the Rule of St. Benedict, you encounter Christ apart from the multitudes that you may, day by day, be converted, and “Christ be formed in you” (Gal 4:19). But, even though you will live your life apart from the world, it does not mean that you are disengaged from the world. Far from it. In fact, your life of prayer, poverty, chastity and obedience will affect the world and the Church more powerfully, as St. Benedict and his followers did originally, when the world of his day was collapsing at the end of the Roman Empire. In this Gospel account Jesus brought about the healing with very physical signs, putting his fingers in the man’s ears, spitting and touching his tongue, looking up to heaven and groaning—all of these, sacramental in nature. Now we are all able to be touched and filled by Christ through the sacraments, the means of grace that He entrusted to us, and most of all, the Holy Eucharist, the very gift of Himself. As we celebrate the Holy Eucharist in the Mass today, and as we celebrate this day of profession and investiture, let us be ever grateful that our Lord remains with us, healing, opening, and restoring us to our status as sons and daughters of God. May, Mary, Queen of Apostles, pray for us. Amen. Praised by Jesus Christ, now and forever. Amen.